We all remember when Gordon Brown was confronted by Gillian Duffy, called her a “bigoted woman” while his microphone was switched on, and had to eat humble pie afterwards. That was probably what lost Labour the 2010 election. And this woman thinks she has fooled you into making her prime minister again. I don’t think for a moment that anybody around Mrs May is stupid enough to let her go around with a live microphone pinned to her after such a meeting – they’ll all remember the Gordon Brown moment – but you can imagine the comments Mrs May must have been making afterwards. “Generally voted against paying higher benefits over longer periods for those unable to work due to illness or disability… 0 votes for, 8 votes against, 7 absences between 2015-2016.” That tells you everything you need to know. 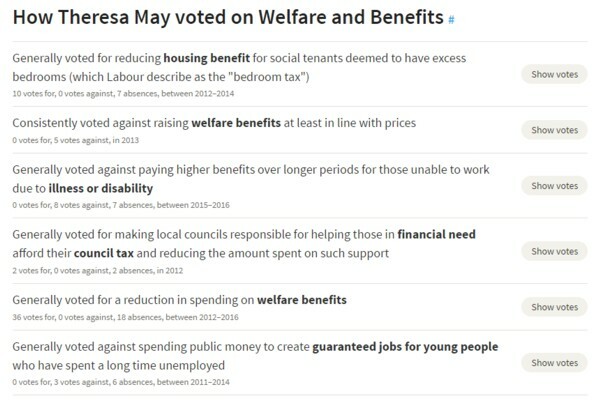 But there’s also: “Generally voted for a reduction in spending on welfare benefits… 36 votes for, 0 votes against, 18 absences, between 2012-2016”. 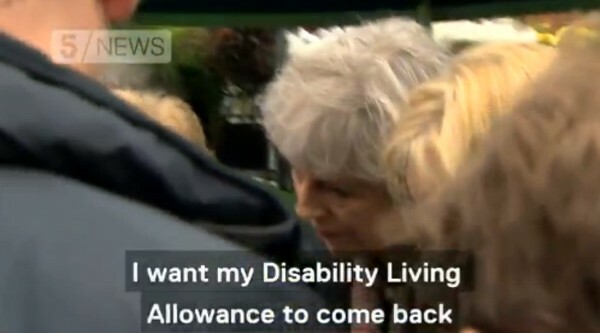 36 votes in favour of cutting the vital benefits that some people need in order to survive! 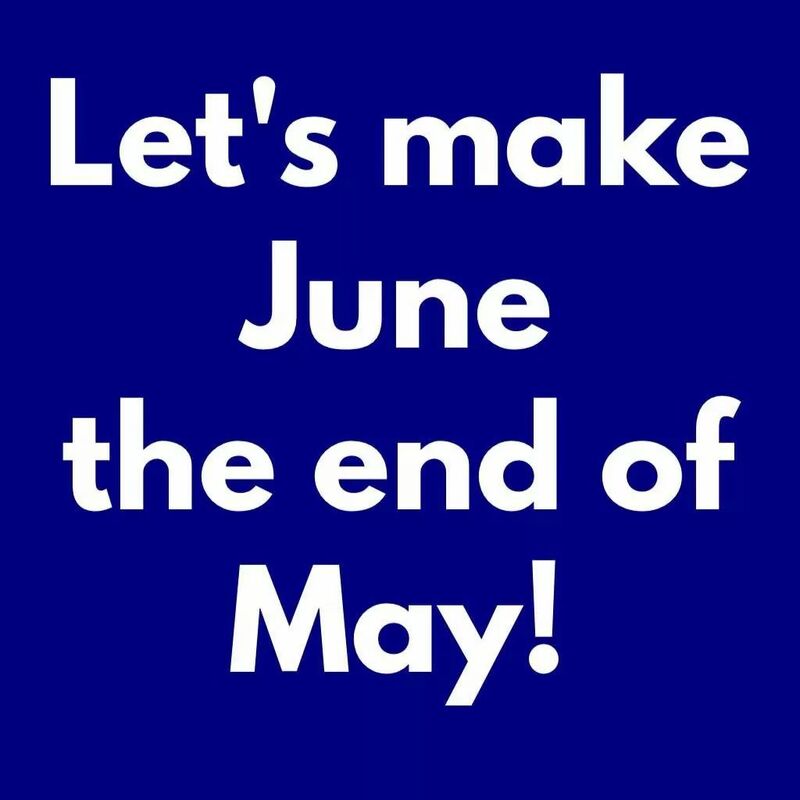 … I was going to suggest the slogan, “Theresa May! On your way!” to be shouted whenever she’s in earshot. You can see why she’s frightened to face real people. It was a wonder Cathy got through the Tory barrier. Wonder how Cathy managed to get past May’s minders? Unemployment figure just went up by 3 or 4 people! Just look at the feigned concern on Maybot’s face that anybody could doubt her,and then clock the complete contempt for Cathy from the local MP & the other Tory woman behind the Maybot. Who let THAT ‘person’ in-their faces are just dripping with disdain for her. I think it’s guaranteed that she will shrink back from meeting the public and return to the “staged” Tory only meetings, staged press conferences and staged TV appearances. Can’t wait to vote and collect my 16-1 winnings in June ! Very concerned about her well-being after this exchange. The Daily M*** chose to publish her full name and, directly under the byline, make the request, “Do you know Kathy *****? Get in touch with the Mail Online newsdesk on…”. Fairly safe to assume they’re not intending to give her a medal so, combined with the avalanche of deeply repellent unmoderated comments below the article, I really hope she comes through this unscathed.